Are you suffering from a damaged tooth, tooth decay, or have recently undergone a root canal? Dental crowns have long been the go-to solution for protecting teeth and restoring smiles. Handcrafted and durable, they offer a level of comfort and beauty that has renewed the confidence of patients past. Take a look at what dental crowns can do for your smile. Dental crowns are handmade tooth “caps” that are constructed from porcelain ceramic, and then molded and colored to look exactly like your neighboring teeth. Once Dr. Hughes, Dr. Mojdami or Dr. Cakmakci has decided that a crown is necessary for your treatment, s/he will take multiple scans of your teeth and may also use molds of your smile. Using these scans and molds, crowns can be constructed for maximum functionality and beauty. Crowns are crafted differently depending on their placement. For example, root canal crowns differ in structure from dental implant crowns, and so on. But the results remain the same: a beautiful tooth cap that restores form and function to a natural tooth without compromising comfort. A mold is when the dentist uses a molding paste to get an exact impression of your smile. It typically entails biting down on a tray of the paste and waiting for the material to harden around your teeth. The tray is removed and a specialized lab creates a cast of your teeth. Using this cast, your doctor and lab technicians will customize a comfortable crown. 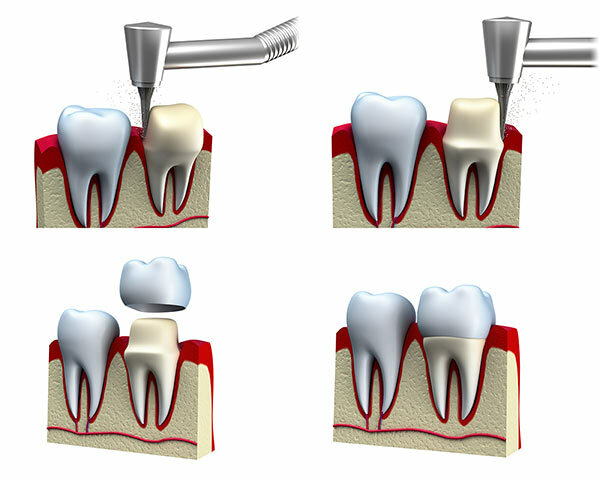 A root canal occurs when the pulp tissues in a tooth are removed due to infection or disease. Once the tooth is hollowed out, it’s filled in with a dental resin (in a process known as a “filling”), and capped with a crown. The crown protects the tooth and filling from further damage, and remains durable and functional against food and bite pressures. Dental implants are an increasingly popular tooth replacement treatment. It is integrated with the patient’s jawbone. As a result, it has the same strength and dependability as a natural tooth. Top this with a beautiful, natural-looking dental crown, and even your friends and family won’t be able to distinguish which tooth is the implant. If your tooth has sustained physical damage, due to a fall or heavy impact to your mouth, we can apply a dental crown to protect your tooth from further damage. Do you suffer from a damaged smile, and are unsure what treatment can help? Here at Christie Park and Elmwood Park Dental, we are dedicated to helping our patients achieve their dream smiles and dental crowns can help reach that goal. Contact us today to schedule a consultation with Dr. Hughes and learn more about how you can qualify for a dental crown today.